Ege Journal of Agricultural Research is the scientific publication of Ege University Faculty of Agriculture that is an international peer-reviewed, open-access journal in the field of agricultural sciences (Horticulture, Plant Protection, Landscape Architecture, Dairy Technology, Agricultural Economics, Agricultural Engineering and Technologies, Farm Structures and Irrigation, Field Crops, Soil Science and Plant Nutrition, Animal Science). The journal is also indexing in the directory and platforms such as TUBITAK-ULAKBIM, TR Index, Clarivate Analytics-Zoological Record, CAB Abstract, FAO/AGRIS, EBSCO, Google Scholar aiming at increase the sharing and spread of information at national and international levels. 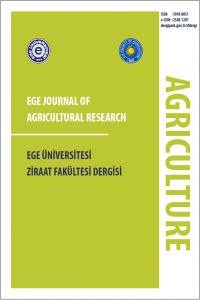 The unpublished original research manuscripts and full text’s of abstracts printed in proceeding books, or relevant review papers (one in each issue) in the field of Agricultural Sciences are published in Turkish or English in Ege Journal of Agricultural Research. Manuscript evaluation criteria of the journal and process are available in related links. The content of all submitted papers is controlled via plagiarism audit software pursuant to the ethical policy of our journal. Responsibilities of scientific contents, results, and convenience of the ethical rules of published manuscript are belongs to the author(s).